Johnny Marr leaves it late with a scintillating run through his Smiths back catalogue to send Liverpool into delirium, Getintothis’ Jamie Bowman salutes one of music’s greatest wingmen flying out on his own. Like that other Manchester icon, Johnny Marr leaves it well into Fergie-time before he rescues this gig from the merely OK to the brilliant. Out is an incredible double blow of utter genius and leaves the crowd at a packed O2 Academy grinning like loons. An hour earlier and the mood was somewhat less fervent. 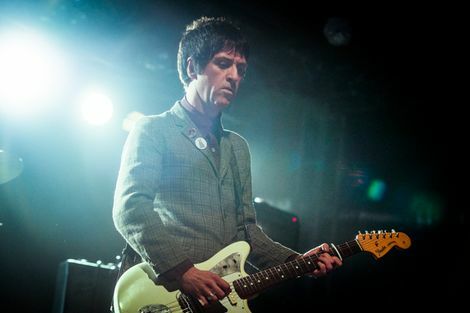 Marr, a dapper looking 49, is embarking on a solo tour for the first time and following the mid-life crisis-esque feel of his stints in The Cribs, and perhaps lesser-so, Modest Mouse, he seems determined to make that tricky transition from side man to front man. It looks odd seeing this perennial lieutenant centre stage. It doesn’t sound quite right either: as cool as Marr looks, his vocals are nothing special when compared with the moaning croon of you know who. Light and anonymous, many of the songs off his new album The Messenger jingle and jangle their way by in a pleasant if not offensive way. Only the beautifully lilting New Town Velocity truly recaptures his 80s heyday. Thankfully, Marr doesn’t seem to have a scorched earth policy regarding his former band’s material and as early as the second song he launches into The Smiths‘ last truly great single Stop Me If You Think You’ve Heard This Song Before. Featuring one of his finest guitar solos, it gives Marr the opportunity to trill away in fantastic fashion. The dilemma of having to be a frontman when you enjoy being one of the band so much clearly affects him though: when introducing his group, made up of various members of previous collaborators Haven and The Healers, he insists they’re ‘not just session musicians‘ and proper mates. It’s a touching but slightly awkward moment. The two minute rush of London (B-side to Shoplifters Of The World Unite) delights the obsessives as does a great version of Electronic‘s Forbidden City, but it’s only when a euphoric Big Mouth Strikes Again is dedicated to Stairs main man Edgar Summertyme that the gig truly lifts off. Electronic‘s Getting Away With It which sees the original’s breezy Balearic melancholia transformed into a taut piece of Franz Ferdinand style art rock. Then come The Smiths‘ classics and a mass singalong that is moving in its communality. 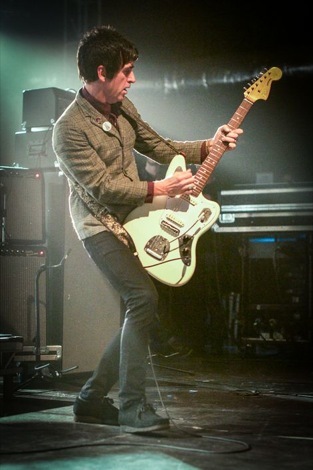 Marr’s Fender Jaguar is raised above his head and for a moment the greatest wingman is flying out on his own. Long may it stay that way.